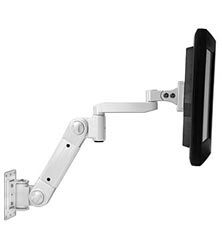 Save desktop space with ergonomic, articulating LCD arms and mounting brackets. 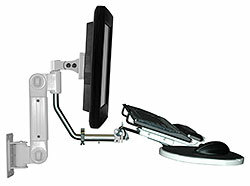 Also known as: LCD Arms, monitor arms, LCD brackets, monitor brackets, flat panel monitor arm, Flat Panel LCD Arms, Flat Screen Arms, LCD Monitor Arm, Wall Mount, Desk Mount, LCD Custom Mounting Solutions. Swing out adjustable mouse tray. Mouse tray can be switched for right or left hand users. Load capacity: 10 - 18 lbs. Keyboard platform with mouse tray. Load capacity: 11 - 20 lbs. Die-cast 165mm (6.5 in.) 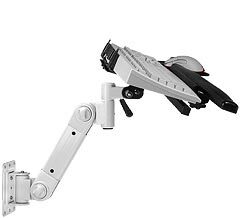 swing extension arm. Load capacity: up to 10 lbs. Spring pressed clamp and rubber cushions tightly hold any keyboard in position. Tray tilt adjustment: 15° up and 25° down.